Order your own copy of Kings of the Isles at your local retailer or online through our website today! The world of Westeros is full of contrast and contradiction. The gentry of King’s Landing may rail against taxes and power-grabbing courtiers, but their lives are posh and easy compared to the ironborn on the windswept rocks of the Iron Isles. And while the Greyjoys forsake royal decrees and courtly intrigues, they are not the only ones in A Song of Ice and Fire who are willing to live by the edge of their swords. 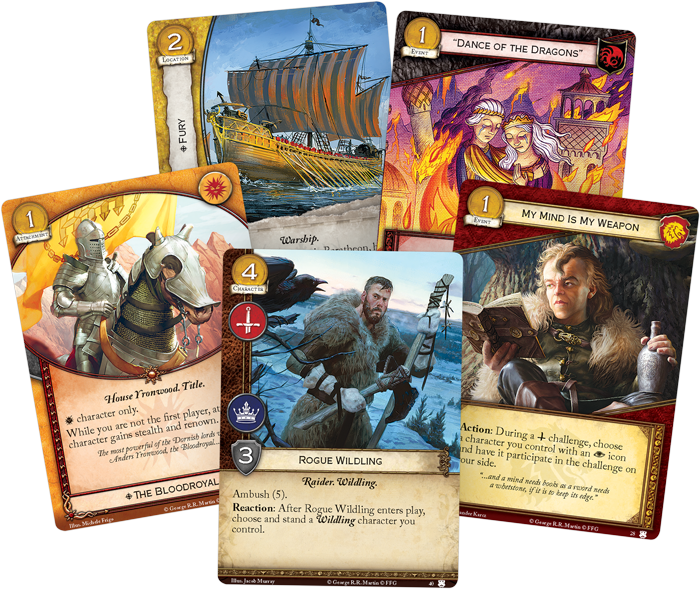 In Kings of the Isles, the newest deluxe expansion for A Game of Thrones: The Card Game, House Greyjoy takes center stage with their raiders, reavers, and a full armada of warships for the Iron Fleet. 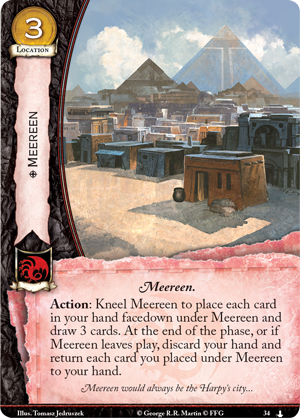 Still, every other faction also gains two new non-loyal cards in this expansion, and today, we’ll take a closer look at the Lannister and Targaryen cards in Kings of the Isles! The Clansmen of Westeros are dangerous and unpredictable, but they can be fiercely loyal to those who have earned their trust—such as Tyrion Lannister. 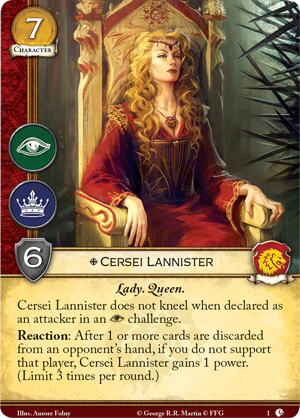 In Kings of the Isles, House Lannister gains two cards that help to bridge the gap between the intrigue-heavy Lannister characters and their Clansman allies. Gunthor Son of Gurn (Kings of the Isles, 27), like many of his Clansman brethren, is a master of ambush. For four gold, you can spring Gunthor into play in the midst of the challenges phase to launch an unexpected attack. But Gunthor is not purely concerned with murder and pillage, like so many of his comrades. 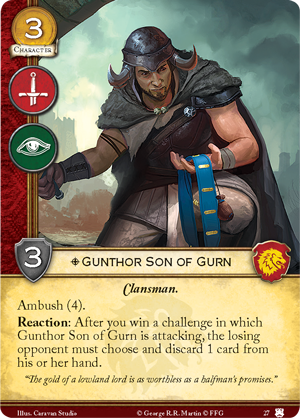 In fact, Gunthor understands the importance of destroying your opponent’s plans—whenever you win a challenge while attacking with Gunthor, your opponent must choose and discard a card from their hand. You’ll only remove your opponent’s least important card with Gunthor, but it still offers you a chance to trigger Cersei Lannister (Lions of Casterly Rock, 1), granting you more power and lending some bite to your intrigue challenges. And if the time comes that you need Cersei to defend her power in battle, you can use My Mind Is My Weapon (Kings of the Isles, 28). This event lets you choose a character with an intrigue icon and have it join your side of the battle during a military challenge! Not only does this give you a boost to unexpectedly win a challenge, My Mind Is My Weapon doesn’t force your character to kneel, leaving you free to make more challenges and press your advantage. Far from the Iron Isles, the open plains of Essos are home to the Dothraki, the mighty horselords. These horsemen also dwell in the wilds, far from civilization and sophistication, but they can certainly turn the tide of battle in your favor. 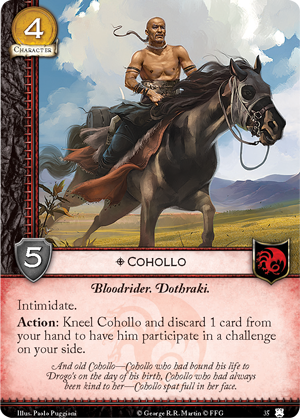 The Targaryen character in Kings of the Isles is Cohollo (Kings of the Isles, 35)—one of Khal Drogo’s Bloodriders, sworn to protect his khal with his life. In the game, Cohollo proves his devotion by throwing himself into any challenge. Cohollo costs only four gold and offers five STR and intimidate. And although he has no challenge icons of his own, that won’t stop you from putting this Bloodrider into any challenge you like—you simply have to discard a card and kneel Cohollo to have him join any challenge on your side. As you can easily imagine, the ability to join a challenge at any stage is crucial. Your opponent must constantly reckon on Cohollo joining the challenge, but if your opponent’s defenses are too strong, you’ll simply hold him in reserve for the next challenge. 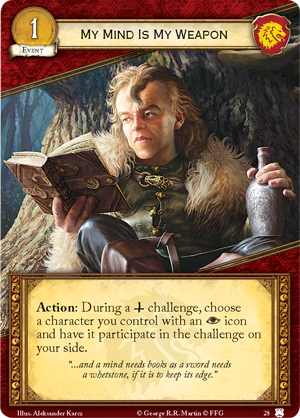 And although you must discard a card to bring Cohollo into the challenge, that’s hardly a problem if you have Meereen (The March on Winterfell, 34) feeding you three extra cards every round. 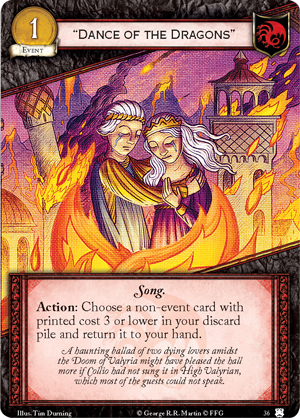 You could even use "Dance of the Dragons" (Kings of the Isles, 36) to bring your discarded card back to your hand. House Greyjoy’s strength is rising with the tide, but they are not the only ones in Westeros who are willing to fight and die for the Iron Throne. No matter which faction you support, you’ll have plenty of reason to pick up the newest deluxe expansion for A Game of Thrones: The Card Game. 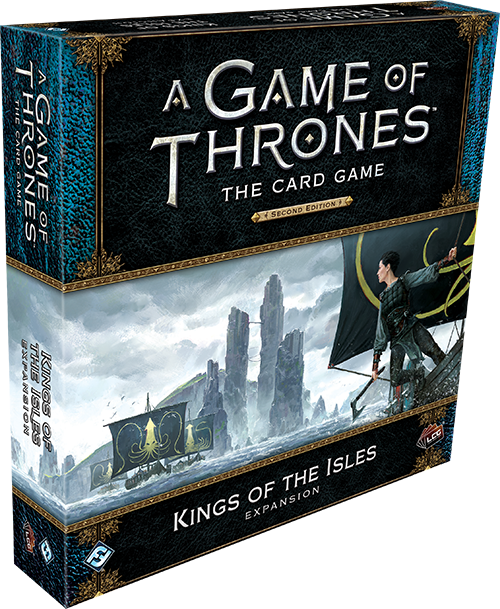 Pre-order your copy of Kings of the Isles (GT45) at your local retailer or online through our website today!